The two-year-old class taught by Sarah explored Nursery Rhymes. They highlighted some favorite classics such as: Hickory Dickory Dock, I’m a Little Teapot and The Itsy Bitsy Spider. Favorite activities included putting band-aids on Humpty Dumpty, pulling plums out of a pie, and making mice to run up the clock on the wall. The three-year-old classes taught by Erica, Georgia, and Amy focused on Fairy Tales. Castles were constructed and gingerbread boys and girls were designed. Beanstalks sprouted, both the paper version and from real seeds! The children were also busy creating houses for the three little pigs and acting out the story. Children with Cassie studied Native American Folklore. They immersed themselves in the Native American culture to appreciate the value that is placed on storytelling. They even got to share stories inside an actual teepee! The dream catchers they wove were beautiful! The pre-kindergarten classes taught by Leah, Maria, and Caila studied Greek Mythology. They all learned what a myth is and loved creating Mount Olympus and learning about the gods and goddesses who lived there. The children were interested to know that Olympic games were held in honor of the gods and goddesses who invented them. Many new mythical creatures were created by the children that were inspired by the ancient Griffin (half eagle, half lion) and Minotaur (half man, half bull). 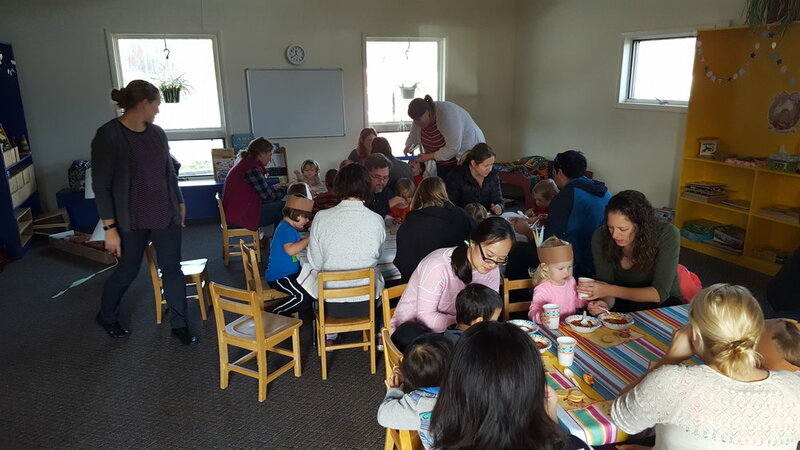 They celebrated the end of the month by having a Greek feast; the three classes got together to chop garlic and olives and knead bread dough to make Greek olive bread. It was delicious! During the month of January the school-wide theme was “Cultures,” during which each age level studied a different country. The Cultures theme was so exciting - the school was alive with the commitment of each class to the country that they were studying. Kenya (Maria, Leah and Caila’s classes). At each stop the children had their passports stamped, marking their visit. The flights rotated so each class had an opportunity to return to their home country (their own classroom) to teach the other classes some fun facts about their country. It was quite impressive to hear the presentations from the children; they retained so much information about their countries - everything from local cuisine, indigenous animals, musical instruments, the flags, the language- so much was represented! STEAM with Cassie - Winter was the consistent theme of Cassie’s STEAM experiments. They made slush out of a mixture of baking soda, sand and water, and then drove cars through them to simulate driving on winter roads. They then discussed car washes and washed the cars in vinegar and observed the bubbly reaction! The class made ramps and observed how various objects slid down. They also engineered igloos out of ice cubes, and snowball launchers (catapults that tossed pompoms). STEAM with Maria and Leah - STEAM lessons in Maria and Leah’s classes focused for two weeks around Healthy Bodies and two weeks on Inventors and Inventions. Maria’s friends explored a human’s blood stream and how it carries nutrients and also germs through the body; they then discussed how to keep germs away! They learned about how to eat a balance of healthy foods in order to help fuel their body. During their study on inventors, they learned about Thomas Edison and the light bulb, the Wright brothers and the airplane, and Benjamin Franklin and the many contributions he made to our lives, including the invention of bifocals! All of the children know someone who wears glasses so it was special to help make a connection between how his inventions are still helping people. Another fun invention the classes learned about was the catapult. They engineered their own and then measured how far their design tossed a pompom down the hall. The school-wide theme for February is “Stories from Around the World.” The classes will be focusing on different genres of stories. It is so fun to see stories come to life in each classroom as the children spend time with the different characters from the tales. They will discuss the origin of the different stories and the older children will learn about cultural influences of the Native Americans and the Ancient Greeks. Learning how to use chopsticks! There will be a school-wide World’s Fair toward the end of the month in which the children will board Heartworks Airways to “fly” from country to country to learn about each of the other cultures that the classes have been studying. All of the children will have passports to be stamped as they arrive at each country. It is sure to be a wonderful excursion- the students will have news to share from their adventures. In addition to the “Cultures” theme the children will be exploring the outdoors which has transformed our playgrounds into a winter wonderland. We have sleds and shovels to play with, build with and exercise our bodies. There will be scientific discussions and experiments about the change in our environment, the formation of snow, icicles, and the dormant state of trees and some animals. There is much to learn and observe during a Vermont winter. Put those tissue boxes to good use! It is our goal to keep our entire school population as healthy as possible. With the guidance of the Childcare State Regulations, Vermont Department of Education and Vermont Department of Health, we have the following health policy. It is best to keep children home who do not seem well enough to participate in the regular activities or to be cared for fully within the classroom; this may include lethargy, severe coughing, difficulty breathing, severe sore throat, earache or abdominal pain. Children who have a fever of over 99.0 degrees are asked to remain home until the fever is less than 99 degrees for 24 hours, without ibuprofen or acetaminophen. Children with a known communicative condition (such as, but not limited to strep throat and conjunctivitis/pink-eye), are to remain out of school until they have received antibiotics for 24 hours. Please inform us of any illnesses so we can inform other families of symptoms to look for in their child. If a student comes to school and is suspected of having a communicative condition, the parent will be called and asked to pick up the child for further diagnosis from a doctor and treatment, if necessary. Children who have had two or more incidents of vomiting or diarrhea, are required to not return until their symptoms have been fully resolved for 24 hours and they are able to resume normal dietary habits and activities. Children with an unknown rash will be asked to see a physician to confirm that it isn’t a communicative condition. Students with a rash and a fever will need to stay out of school until confirmation of the rash and the child is fever free for 24 hours. Children with head lice and/or nits, can be in school after receiving a first treatment with a product that will kill head lice. Parents are asked to pick out the small nits (eggs) each day for at least ten consecutive days. We will also be checking all of the children at school. Whenever head lice are found, the parent will be called and asked to pick up their child and apply treatment. If your child has any of these conditions, please care for them at home. We will miss them while they are ill, and this will hopefully enable all of the students to remain healthier and in school. If your child becomes ill at school, you will be called to come and take him or her home. If we are unable to contact you, we will reserve the right to call the emergency contact on your child's application. The class explored various modes of transportation on land, on water and in the air. The classroom was transformed into a vehicle wonderland with roadways and ramps, construction vehicles in the sand table, and there were box cars in the classroom that the children could “drive”. 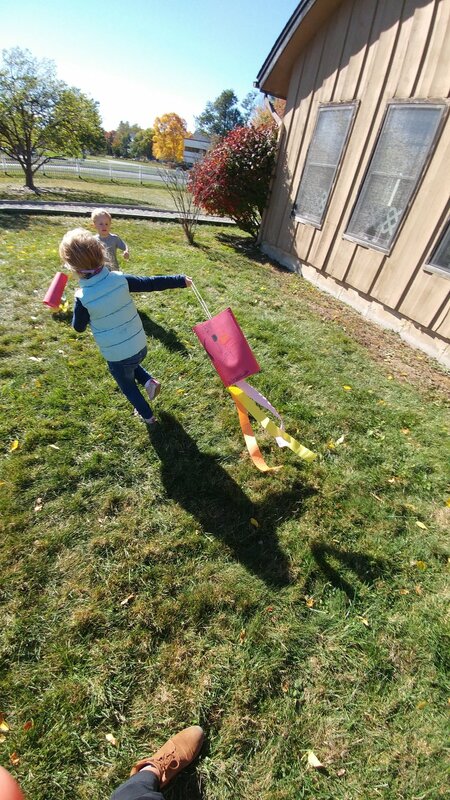 There was a rocket that flew along a string across the classroom powered by the wind from a balloon. They designed hot air balloons, airplanes and boats. They capped off the month by making a delicious Harvest Soup and hosting a feast for their families to celebrate Thanksgiving - complete with a parade! The friends in this class learned about and made discoveries involving the five senses. There were so many fun activities that they did to explore how we use our senses. 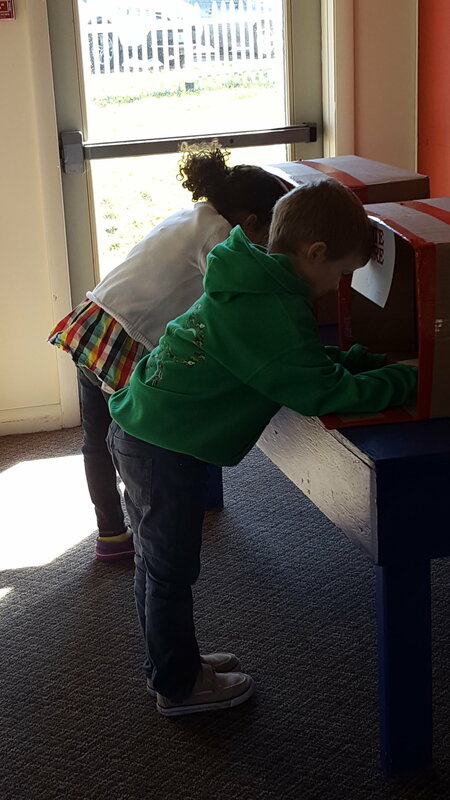 They tried to identify an object in the “Mystery Box” using only the sense of touch. They conducted a blindfolded taste test, which was one of the highlights of the month. They also reflected on how many of their senses were engaged as they played with playdough- they could see it, they felt its texture, and they smelled it. After this month the children are now more aware of how important our senses are! Erica and Amy led the children on an exploration of the human body, both inside and out. They learned about the anatomy of our bodies- identifying different body parts and defining their purpose. They created a human mural, adding body parts as they learned about them.They also touched upon nutrition; how the food we eat affects our wellness. They created gardens of healthy choices as a way to emphasize the importance of eating well. Cassie’s class studied the various types of weather that we see. Every morning they noted the weather that they were experiencing. They did various science experiments and art projects involving clouds, rain, and rainbows. They even did a science experiment to create snow! The Pre-kindergarten classes were focused on Solar System this month. They identified and learned about each of the planets, including the order in which they are aligned, and features of each planet. They learned about the stars, the sun and the phases of the moon. They all discussed being astronauts and what it would be like to blast off in a rocket ship! 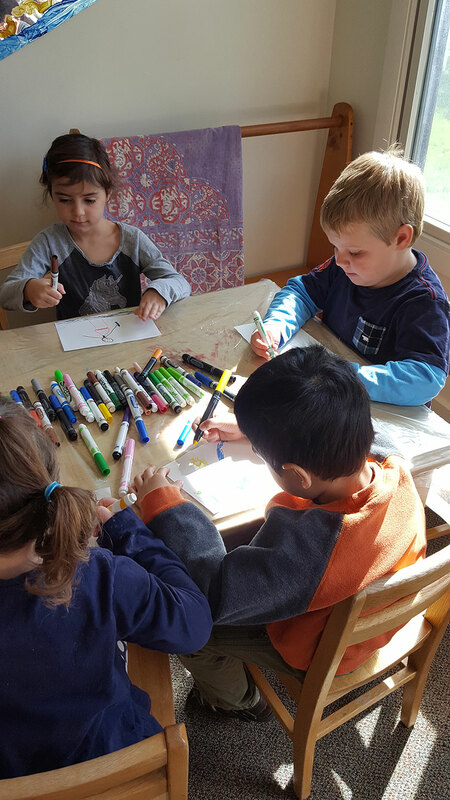 Afternoon STEAM Class with Cassie - This month the children were engaged in many Thanksgiving related activities. They experimented how to keep the feathers in the air using straws. They baked pumpkin bread and unanimously decided to deliver it to the police station as a way to say thank you for all that the police officers do for us. This class also sorted and counted all of the items that were collected for the Williston Community Food Shelf. Afternoon STEAM Class with Maria and Leah – The children explored the concepts of hibernation and thankfulness in November. They sorted animals based on whether or not they hibernate. They did an experiment involving lard and an ice bath that allowed the children to experience the effectiveness of blubber as an insulator. They engineered animal dens as well. Inspired by thankfulness, they baked treats for some special neighbors in Blair Park: the postal workers and the dentist’s office. The children also designed and implemented a project and engaged the entire school by cutting out strips of paper to create a chain of gratitude. It was so exciting to watch it grow each day as students and parents added links! In the event of snow or another form of inclement weather, the schools may close for the day or delay opening. Here are a few places to look or listen for school closing information. The School Directors will send out an email. This will typically be between 6:30 and 7:00. Many radio and television stations broadcast this information on an on-going basis. Many TV and radio web sites have a link on their home page that says “closings and delays” – all schools in the area are listed there. We are located under: Chittenden County, Heartworks, Renaissance, Endeavour Schools (when all schools are cancelled). In the event of a “two hour delay” in opening, we will open to receive children beginning at 10:20. The time is calculated from when the morning program begins (8:20) and early care is not available on these days. Parents who may have a challenging commute to or from school during inclement weather are welcome to arrive late in the morning or choose to have their child stay home. During the school day parents are welcome to pick their child up at any time that best suits their needs. We try to remain open as long as possible in the day and if the weather becomes increasingly difficult during the day, we may close early at 4:30 or 5:00. The classes are exploring various modes of transportation on land, on water and in the air. The classes will learn about physical components of the human body including how food we eat affects our wellness. Children with Georgia – Five Senses. They will be exploring the importance of each one of our senses, and how our body adapts based on the senses being used. Cassie’s class is studying the various types of weather that we see, and even some extreme weather which we don’t usually experience here in Vermont. The Pre-kindergarten classes are focused on Outer Space this month. They will be identifying and learning about each of the planets, including the order that they are aligned in, and features of each planet. They will be discovering facts about the stars, the sun and the moon. They will be discussing what it would be like to be astronauts. The STEAM classes will be connecting thankfulness and giving with Science. The focus will be on how nature works in harmony to support all living things as we prepare for the winter months ahead. Concepts of harvest and hibernation will be covered in a variety of activities. During the month of October, children with Sarah and Amy learned about Life in the Forest. They took advantage of the “Magical Forest” on our property. They discussed what a forest is comprised of and who lives in the forest. They were able to make observations about the changes that occurred in the Magical Forest over the course of the month. They created crafts with items from the forest including beautiful leaf rubbings and a leaf collage. They also made a wonderful bear cave filled with a happy family of bears! The children with Erica, Georgia and Amy discovered Life in the Desert. They discussed the difference in climate between Vermont and the desert. They learned where some deserts are in the world. They discovered plants and animals that live in the desert including rattlesnakes, camels, elf owls, scorpions, wolf spiders, and roadrunners; and they learned how these things survive in the desert environment. Children with Cassie learned about Mountain Life. They discussed how lucky we are to be surrounded by mountains in Vermont. They talked about different activities that people do on mountains, including camping! They learned about different animals that live in the mountains. They created a giant mountain mural and adorned it with mountain goats, bears and soaring bald eagles. Maria, Leah and Caila focused on the Rainforest last month. They pinpointed where in the world rainforests grow. They compared and contrasted rainforests to forests in Vermont. They identified and artfully represented the four layers of the rainforest on murals and discovered the exotic animals and plants that inhabit each of the layers. STEAM Class with Cassie engaged in some wonderful seasonal experiments. They went into the Magical Forest to engineer animal homes out of materials they found in the forest. They learned about static electricity and rubbed a balloon on their head to generate enough static electricity to raise a ghost and bat off the table! STEAM with Maria was focused on weather and trees. They did experiments to answer inquiries such as: How much water can a cloud hold before it starts raining? Which style of paper airplane flies best? Why do leaves change color? STEAM class with Leah also studied weather and trees this month. They engineered weather vanes and windsocks and tested them outdoors and with a fan. The children also had the opportunity to use real screwdrivers and hammers to screw and nail pieces of wood. Everyone was incredibly focused on this task! If you are interested in making a donation of food, our guideline suggest that your donations be of non-perishable foods in intact, unopened and undamaged containers that are of current date. We welcome donations of pasta, pasta sauce, canned vegetables and fruits, soup, tomato products, canned protein, tuna, crackers, canned beans, coffee and tea, cereal, snacks, juice, macaroni and cheese, and rice and pasta side dishes. We are also happy to receive toilet tissue, personal hygiene products, condiments, and pet food. Unfortunately, we cannot use large packing of products that you might purchase at warehouse stores. There will be collection receptacles around the school for the items that you bring in. If possible, please involve your child in the purchasing and delivery process so they are aware of the gesture of giving to someone in need. We will also be engaging the children in activities to sort and count the items in school before we deliver them. Thank you in advance for your participation. Every item helps to make a difference. On October 4, seven Heartworks staff members attended the Gubernatorial Candidate Panel Discussion on Early Education. HRE was a sponsor of this event that was held at UVM. Many other educators also attended to learn more about the candidates’ thoughts and plans about addressing early education in Vermont. On October 25, HRE hosted a panel discussion at Champlain College for Education Majors. Nine HRE members attended along with the college students, a Champlain Faculty Member and someone from Let’s Grow Kids program. Paul Zengilowski led the panel discussion by asking questions that would be helpful to the students in their planning and preparation for securing a job in education. The questions ranged from how best to be prepared for working with young children, tips for when children may decide to do something other than the lesson, how best to make decisions with always the focus on the best interest for the children, working with parents, and so much more. The panel consisted of Lia Barnes; Danielle Harris – Renaissance School Director; and Directors of Heartworks – Joanne Pillsbury, Kathleen Schaffner, and Ashley McKinley; and Georgia Morris, a teacher at Heartworks Williston and a recent graduate of Champlain College. The education students had a chance to ask questions and share their thoughts followed by opportunities for the education students to socialize with the Directors and ask further questions. One highlight was when an education student said she worked at a summer camp this past summer where a Heartworks’ child was in attendance. 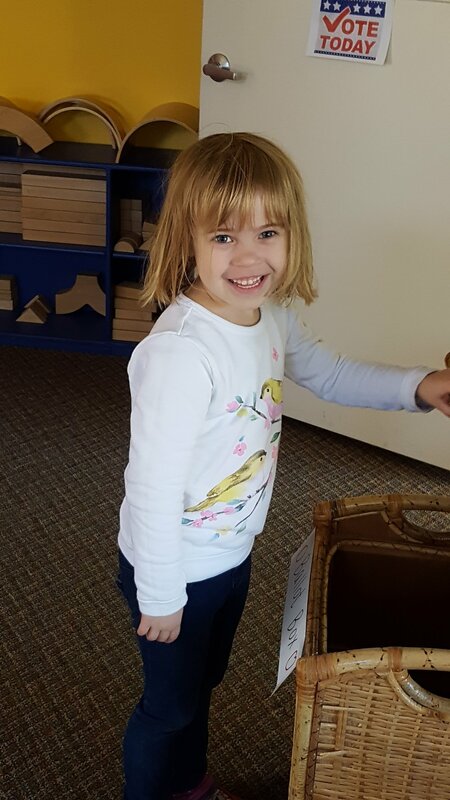 It was shared of how the child had social, emotional, and life skills surpassing those of the other campers and how this three year old was quickly the leader of the campers and one who was looked to for learning to follow directions and making great choices. 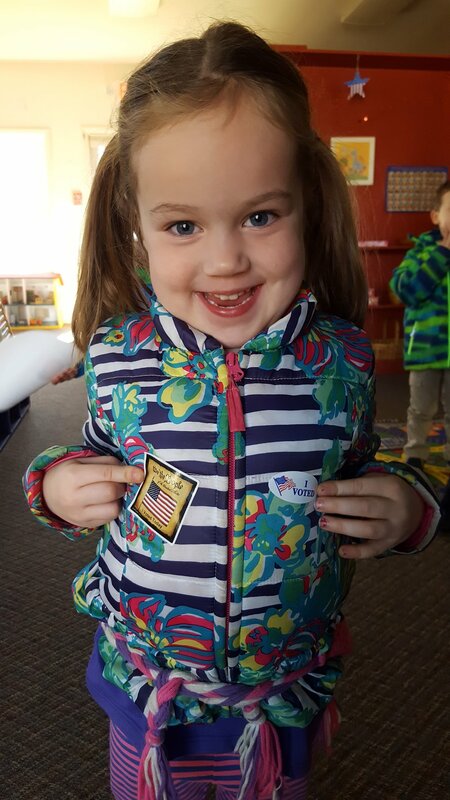 This was another testament to the wonderful educational Heartworks Preschool program that we provide, and to our teachers who are so dedicated to early education. We look forward to additional collaboration with Champlain College and thank them for supporting this event. Over 60 Faculty members of the Heartworks, Renaissance and Endeavour Schools gathered together on Friday, October 21 for a day of Professional Development. The schools maintain an active schedule of staff development programming each year designed to meet the needs of the Faculty throughout the organization. The Heartworks’ workshops included discussions about Smooth Transitions in the Classroom, Outside Time, Classroom Management and Strategies, Teaching Phonics, Theme Program Discussions, Career Growth through Professional Development, Character Development Curriculum and presentations from Mutual of Omaha and The Richards Group on our new employee benefits. Workshops were led by Lia Barnes – Director of Curriculum and Instruction, Erin Hyer – a licensed and certified speech language pathologist, Andrea Beam – Director of Finance, Administration and HR, some of the School Directors and Lisa Zengilowski. The Faculty had opportunities to work in small and large groups, and collaborate with teachers from the other Heartworks Schools. It was a highly productive, joyful and beneficial day for everyone! In keeping with our belief in classical education and to minimize distractions, please do not send your child to school in clothing that includes any pictures or images associated with television shows, cinematic themes or commercialized toys, super heroes, games, or video games. We also believe that children should not wear hats indoors. Thank you for helping to follow these guidelines. As the cold weather is upon us, it is very important that your child has a heavy fleece or warm jacket, hat, and mittens to wear outside. Very soon it will be necessary to add snowpants, warm boots, heavy jacket and waterproof mittens. Please label, with your child’s name, all clothing items with a permanent marker including hats, mittens, snow pants, boots, etc., since many of these items look alike. Some items can become misplaced, and a labeled item finds its way home much faster. The Heartworks, Renaissance, and Endeavour Schools cannot be responsible for lost or misplaced items. Even though it was recently 80 degrees outside, October is here and this is Vermont and it’s never too early to begin thinking about winter gear for your child. We all know how quickly children grow out of their clothes, and it can be frustrating to spend so much money each year to purchase new items when last year’s gear is barely worn! At Heartworks Williston we recognized that we have an opportunity to help each other out, so for the month of October we are going to be organizing and hosting a winter gear exchange! The idea is simple: Have gear? Leave gear. Need gear? Take gear. Do you have gently used winter gear that no one in your household can fit into anymore? Bring it to school and we will have different areas of the “Big Room” sectioned off by sizes for you to drop it off. Do you need gear for your child? “Shop” to the see if there is anything that will suit your child and you can take it. Please note that we are limiting “gear” to include child-sized winter jackets, snow pants, snowsuits and boots. We will set up the Big Room to be ready for donations and “shoppers” at approximately 8:20 each day in October (except on Music days or rainy days when the Big Room will be used all morning). The gear will remain out until 4:30 so you are welcome to stop in throughout the day. At the end of the month any unclaimed gear will be brought to Goodwill. 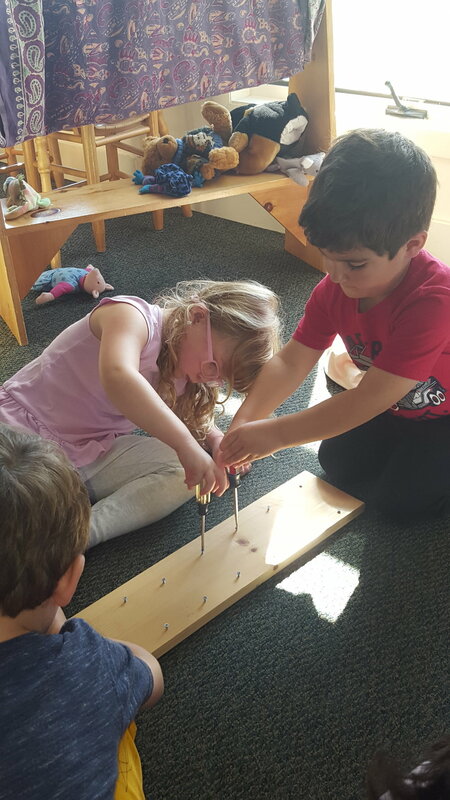 The Heartworks Preschools have an enrichment program in the afternoon that incorporates Science, Technology, Engineering, Arts, and Math (STEAM). Each day the focus of the afternoon curriculum is on one of these areas, combined with our traditional classrooms values of sharing, respect, courtesy, and listening. Through a broad range of fun and creative activities, the children are encouraged to make predictions, develop hypotheses, ask questions, explore, imagine, build and experiment. 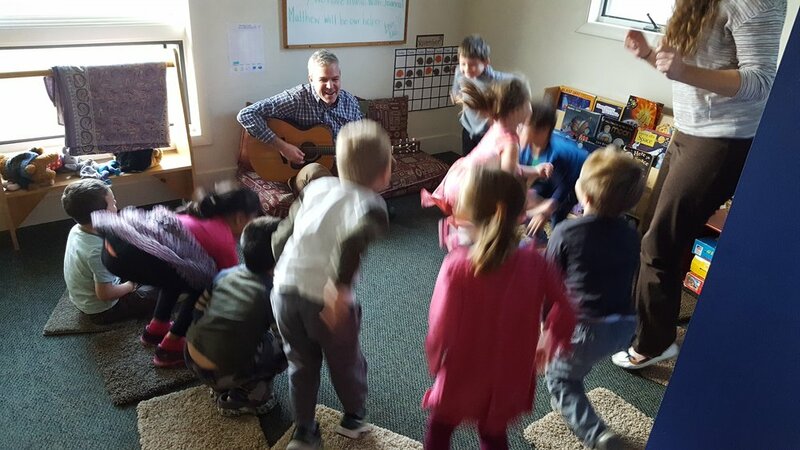 STEAM with Cassie: The STEAM class in Cassie’s room did a multitude of activities. Some of the highlights included experimenting with magnets- How do they work? Do they work through certain materials? The class also explored art after reading “Beautiful Oops” and discussing how we can create beautiful artwork out of a “mistake.” The class also did a week-long focus on insects integrating each of the STEAM elements into the theme from researching and observing insects found around our school, working with magnifying glasses on Technology day, building ant colonies on Wednesday, creating ants out of egg cartons on Thursday, and adding insect legs for Math on Friday. STEAM with Maria and Leah: During STEAM this year Maria and Leah will be teaching lessons revolving around biweekly themes. In September the focus was on Transportation and Apples. They created boats that floated out of tin foil, they engineered two different types of airplanes, and they created vehicles from recycled materials. 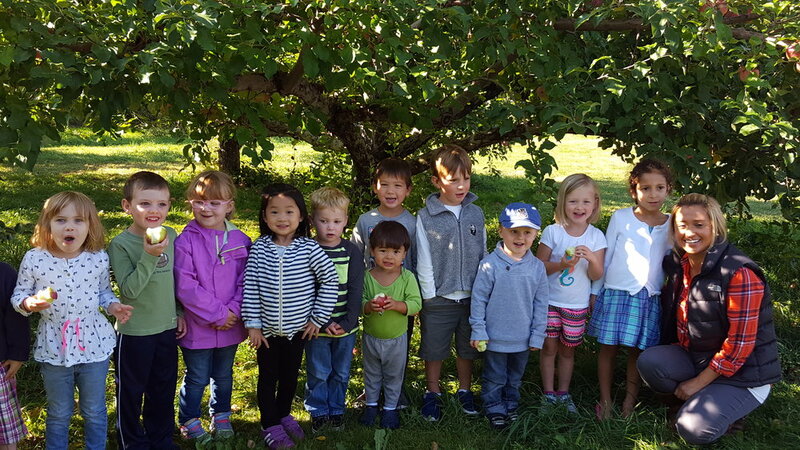 When learning about apples, they dissected them and labeled each part of the apple, made observations about the seed core, made applesauce using a ricer, used an apple corer and peeler, and played apple math games. Want a gorgeous website done right, on budget, and on time? You’re in the right place. I’ve got over a decade of experience and know what it takes to create stunning websites that get real results. 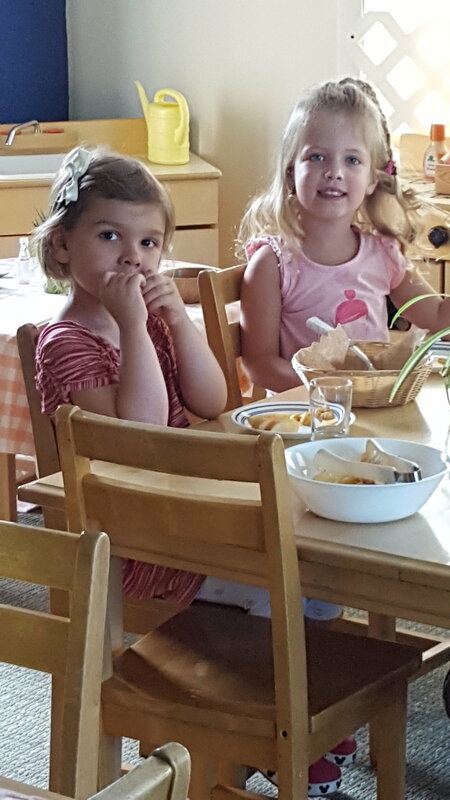 Children with Sarah and Amy spent the month learning to feel comfortable at school. They formed bonds with their teachers and each other while discovering all of the fun things that they can do at school. There are really fun materials and activities that Sarah offers for them including: a train table, playdough, pom pom sorting, painting, baking and so much singing and dancing together! Children with Erica and Nicole are off to a wonderful start! They are already having so much fun with each other. They have been working hard on creating their family apple tree, painting their family portraits, graphing the pets that they have, and learning new songs! Children with Georgia: How much growth there has been already amongst this group of children! They are settling into the routine and are forming an incredible bond as a class. They have enjoyed enrichment projects involving gluing, sculpting with playdough, and music! Children with Amy are having a great time at school! 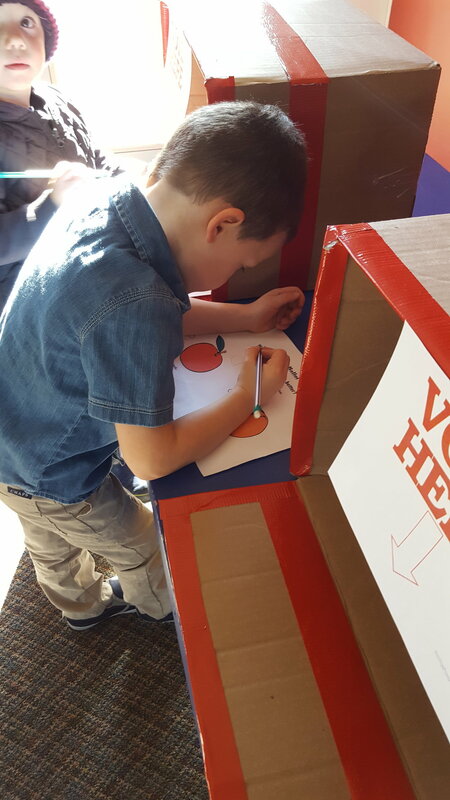 They have already explored a variety of different kinds of activities such as practicing their handiwork as they sewed paper apples, following oral instructions when playing games such as Bingo, and learning new art techniques such as using watercolors. Children with Cassie are learning about community helpers in such fun, creative ways. They have made fire fighter helmets, and functional mailboxes; they healed teddy bears by placing band aids in the right places by matching up shapes, and they practiced their cutting and hairdressing skills by cutting the yarn hair of some popsicle stick dolls. Pre-kindergarten children with Maria, Leah and Caila have been learning about Friendly Neighbors. They have explored this concept on an immediate level as a school community and then broadened the scope to include the larger community of the town in which they live. 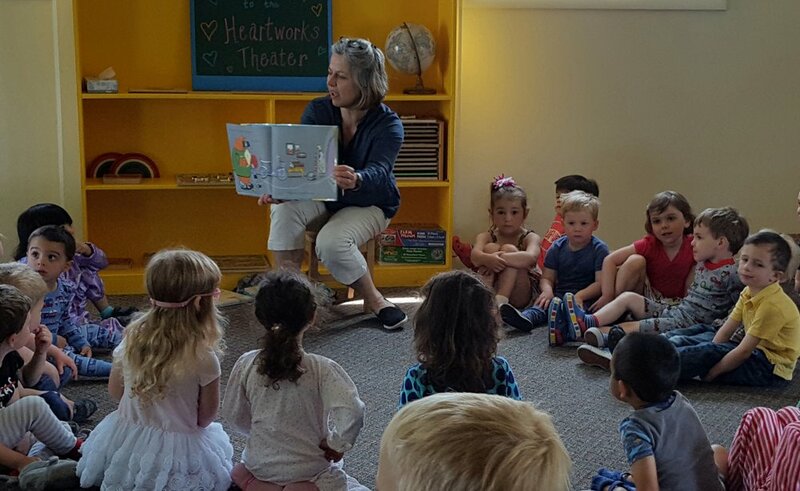 From beading friendship bracelets, to baking muffins, building houses and engineering roadways to connect neighborhoods, the Pre-kindergarteners are off to a strong start this year. They also had the opportunity to ride our school bus to go on a field trip to Adams Apple Orchard to pick apples. 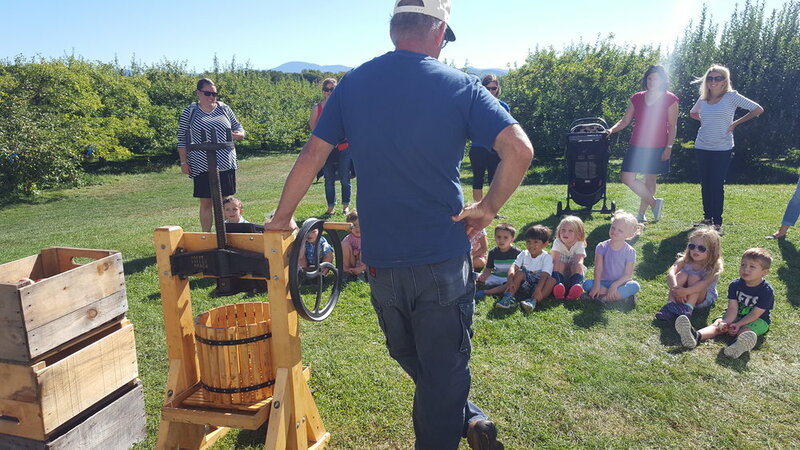 What a marvelous time they all had at this beautiful local orchard. October’s Morning Overall Theme is Animal Homes and People Homes. At Heartworks we have established a tradition to conclude our school year with a ceremony for the children in our older classes. The ceremony includes a performance of songs that the children have been working on with Joanna followed a presentation of a certificate for each child. It is a wonderful way to mark the end our year together. The closing ceremonies will be at Heartworks Williston in the “Big Room” on Thursday, June 2nd. School will close at 3:00pm this day to accommodate the ceremony. We look forward to seeing you there, as this is a cherished occasion for the Heartworks community. In preparation for the Closing Ceremonies, Joanna will be conducting rehearsals at school. The dates and times of each of the rehearsals are listed below. If it is not your child’s day to come to school, we encourage you to bring them to school for these rehearsals so they can feel more confident with the rhythm of the ceremony. Please arrive 5 minutes before the allotted rehearsal time and we ask that you remain on site for duration of the rehearsal. Thank you for your participation and support. Sarah’s two-year-old class had a great time with their theme: “Water is Fun.” They experimented with something new in the water table each day, from bubbles, to shaving cream, enormous ice cubes to squirt bottles; what an exciting way to start each day! They were introduced to the water cycle, painted with watery paint, and created some beautiful water drop decorations from melted wax. The three-year-olds with Megan, Cassie and Amy learned about rivers and streams. They learned about the characteristics of rivers and streams as well as the various animals and plant life that can be found in and around them. Amy’s class set up a campsite next to their river, complete with a campfire to cook their food on! The Pre-kindergarten classes taught by Maria, Heather and Caila studied lakes and ponds last month. Each class made wonderful representations of the wildlife that live in and around ponds. They also studied the water cycle and did activities which integrated the different phases of water. Heather’s class did an experiment which highlighted the impact of water pollution. March was a special time of learning as the themes were “Teacher Choice” during this month. Sarah’s classroom was full of feathered friends! They brought the theme of Birds to life by creating wonderful bird feeders and setting them up outside the window. A reference poster was nearby along with some binoculars so the children could identify the various feathered visitors. The class built a life-sized nest which was a favorite place to play. There were many creative art projects and songs to help highlight the featured flying creatures. Megan’s class went back in time to the prehistoric era to discover dinosaurs. They became paleontologists digging for fossils in their sand table. They excavated dinosaurs from ice and also used tools to delicately dig through edible “dirt” (cookie crumbs) and “mud” (pudding) to find a special edible (gummy) creature in their bowl! Amy’s class explored “Up in the Air” this month. 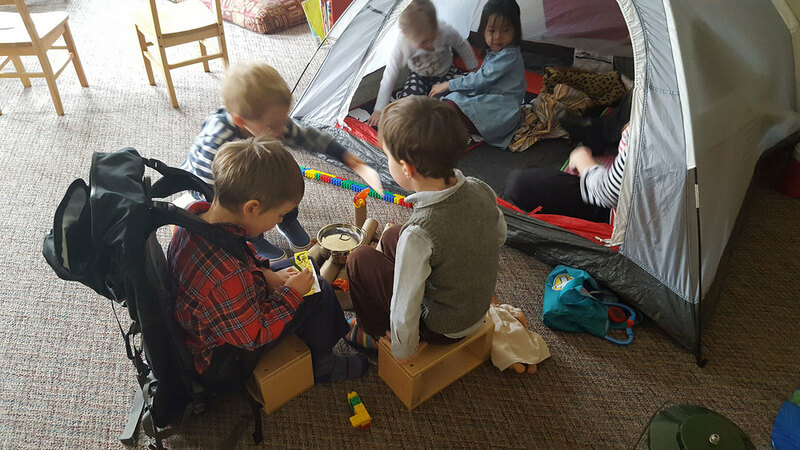 Their dramatic play area transformed into an air traffic control station as the children launched into the atmosphere in their rocket ship. They built a jet that hovered in the classroom and also studied the differences in the sky during the day and the sky at night. Cassie’s class studied “Life on the Farm” during the month of March. They explored animals that live on farms and also discovered the process of raising and harvesting crops. They discussed the importance of farms in our everyday life. It was such a nice unit that raised the children’s awareness and appreciation for where our food comes from. Katherine’s class studied Frogs this month, hopping from one activity to the next! They measured how far they could hop compared to the average frog. They learned about the variety of species of frogs and were scientific in comparing the different properties of each type. They learned about camouflage first-hand as frogs were stashed around the room in spaces in which the frogs blended. The children had fun finding them! They also played a fun Feed the Frog game, working on their hand-eye coordination by tossing bugs into a frog’s mouth and using the frog’s sticky tongues to catch numbered or lettered flies. Maria’s class studied Columbia this month - where Maria was born. They learned a lot about the climate and culture of this South American country. They were able to compare it to the other cultures that they have learned about already this year. For the children, the world is becoming ever smaller with each new nation that they visit. They are learning that various ways of life are acceptable and exciting! Heather’s class learned about rocks this month. It was a very engaging month full of experiments and hands-on studies about the various geologic formations that exist all around us. They did a fascinating experiment about igneous rocks by layering pieces of crayon under sand and water. When the water was heated (imitating the heat from the Earth’s core) the crayon melted, and created a path upward through the sand until it surfaced (like a volcano). Then as it floated and cooled further away from the heat source, it hardened again. I’m not sure who was more excited, Heather or the children! Caila’s class ventured to Canada this month. They learned about the culture and geography of the large country. From the language, provinces, Royal Canadian Mounted Police to the igloos up north - there was a lot to learn! The children connected their studies to their former lessons about Kenya, so they were able to compare similarities and differences between the two nations. How wonderful to learn to appreciate different cultures; becoming familiar with various regions cultivates a sense of acceptance and respect.